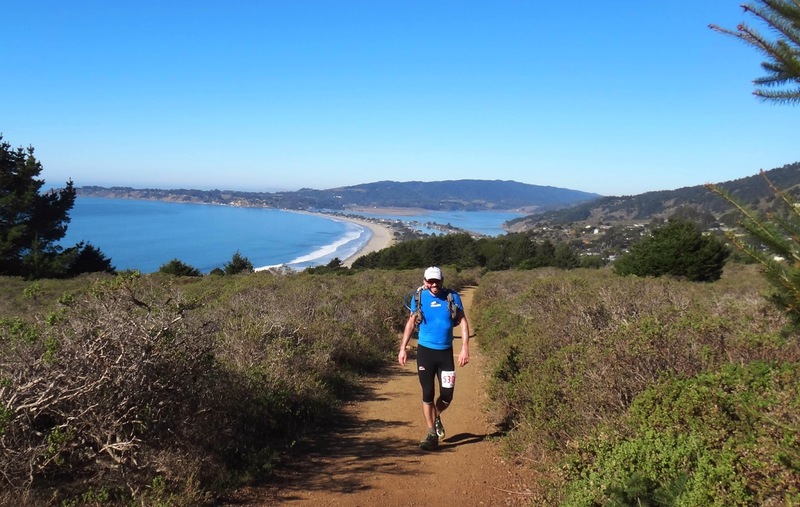 Thanks to the regular race schedules of the Bay Area's three trail running event organizers, and the annual regularity of our own training cycles, Beat and I have several local races that we've run many times. 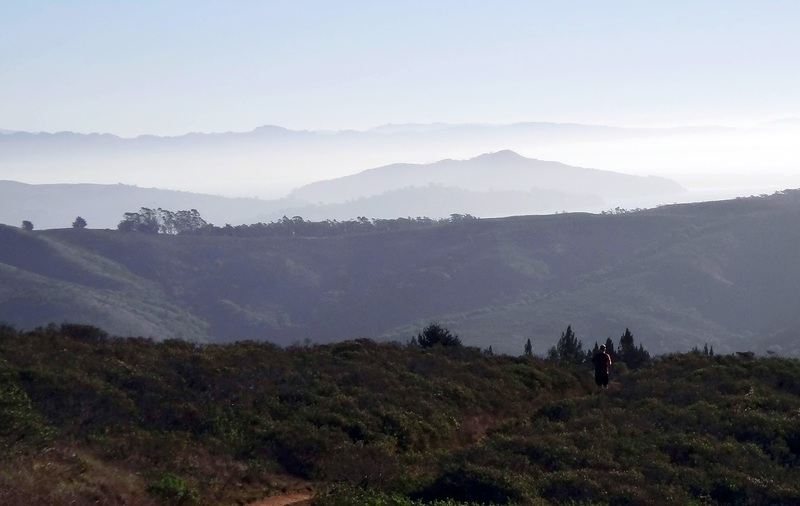 The Steep Ravine/Mount Tam 50K in the Marin Headlands is one of these races. I've run it five times ... five times! It's a little embarrassing, because this particular run never seems to go all that well. It makes sense, I suppose. Most of the climbing is quite steep, necessitating a walking speed, and I'm uncomfortable enough on steep descents that I end up walking or slow-shuffling a lot of the downhills as well. There's always that smidgen of hope that I'll have some kind of breakthrough in my trail running technique at Steep Ravine — which usually ends in disappointment after long hours of frustration accompanied by some kind of low-level pain. It was a beautiful but hot day. I think California's severe drought is now well-publicized enough that I don't have to explain my grumpiness about weather that's 75 degrees and sunny in January. But the part of me that was really grumpy on this day was my IT band. I had problems with the same nagging pain back in October, but it hasn't bothered me at all since. Possibly a result of putting in too many faster running miles last week, the tightness and mild burning pain flared up again on Saturday. Specifically, it came back during the first descent in the race, on a trail called the Heather Cutoff. This rutted, dry clay, somewhat overgrown singletrack is built with what seem like a dozens of ridiculous hairpin switchbacks over the course of about 700 vertical feet, drawing out what should be a short descent interminably. My right IT band tightened like a rusty chain and I responded with quiet swearing ... "$%@$ concrete-hard %$#&*!^$ hairpins $%*!" Admittedly, this descent pretty much set the tone for what really was a scenic run on a beautiful day. 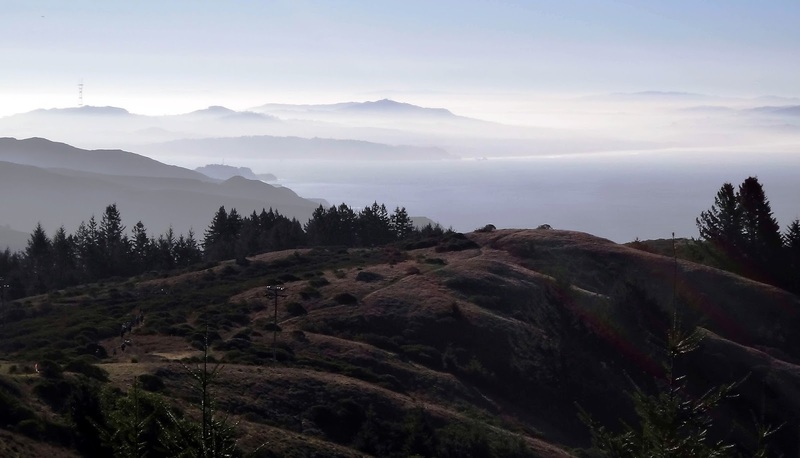 This course consists of two 25K loops that climb and descend the face of Mount Tam four times. I met Beat before the turnaround, already three miles ahead of me. By this point I was resigned about the grumpy IT band but also resolved to work through it — by slowing down and actively taking measures not to aggravate it while continuing to make forward progress. This is, after all, what we're training for. Participating in a long haul like the Iditarod always takes a period of adjustment. By the end of the first day, nearly everything hurts. Back aches, quads burn, ankles swell and knees are sore. It seems impossible to continue but this is just part of the transition to the new normal. Bodies do adjust, but it's something the mind has to facilitate. This is why it was important to me that I get through Steep Ravine, by slowing down and working with my grumpy IT band rather than against it. When it tightened up, I backed off the pace, even when it felt snail-like, and even when I was walking down the practically level ridiculous &*$! hairpins of the Heather Cutoff. Big mountain bike ride! I wanted to put in another back-to-back effort this weekend, and even before IT band pain crept in, I planned a ride as my second long workout. Although I do enjoy trail running quite a lot these days, I continue to believe that high mileage in training and daily running is not the best thing for my body. But there's really no such thing as too much biking — am I right? As it turned out, this plan worked extra well because cycling is one activity that doesn't seem to aggravate my IT band at all. In fact, I started out the day having a difficult time climbing out of the saddle because my right knee was so stiff, but by the end of the day the whole leg was loose and happy. Yay for biking. 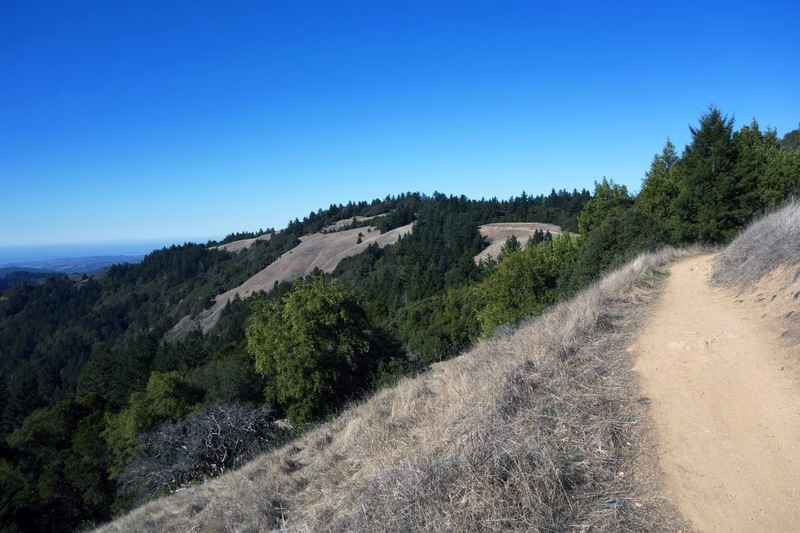 During the week, I spent some time trying to map out a new loop through the Santa Cruz Mountains, hoping the bike-sploring factor would keep the ride interesting and thus keep motivation humming when I was sure to be sore and fatigued. My research ran into a bunch of road blocks in the form of private roads and too many no-bikes-allowed trails. So instead I plotted a variation of a loop through Big Basin Redwoods State Park that I've ridden before, and invited my friend Liehann to join. Liehann is a great riding partner — he pushes the pace but he's patient as well. I hoped having him along would prevent me from becoming lazy on difficult ascents or bailing altogether. On this route, there is a lot of climbing. 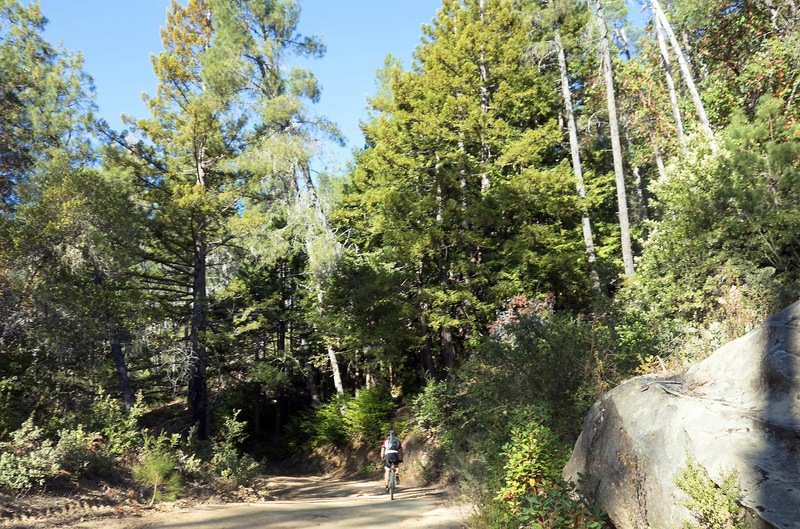 We started at my apartment and pedaled into the mountains up Steven's Canyon and the Grizzly Flat Trail, then onto the dry hills of Long Ridge. The first hour was rough for me, but by the time we reached the crest, I was settling nicely into comfortable endurance mode. We occasionally stopped to chat with other Sunday mountain bikers, and one woman commented on my seemingly huge backpack. The day before, during Steep Ravine, I became dehydrated and never rectified that after the race. As a result, I woke up in the middle of the night with a truly horrible hangover-like headache, which kept me awake for hours. The specter of that headache and the knowledge that there was only one known water source on our entire route prompted me to pack a lot of water, along with lights, jacket, hat, mittens, food ... I was having one of those "I'm tired and I need my security blanket" days. The big backpack makes me slower, but no water makes me miserable. Anyway, I explained that we were planning to spend the whole day riding, so I came prepared. She was impressed with the ground we'd covered so far, and we were just getting started. 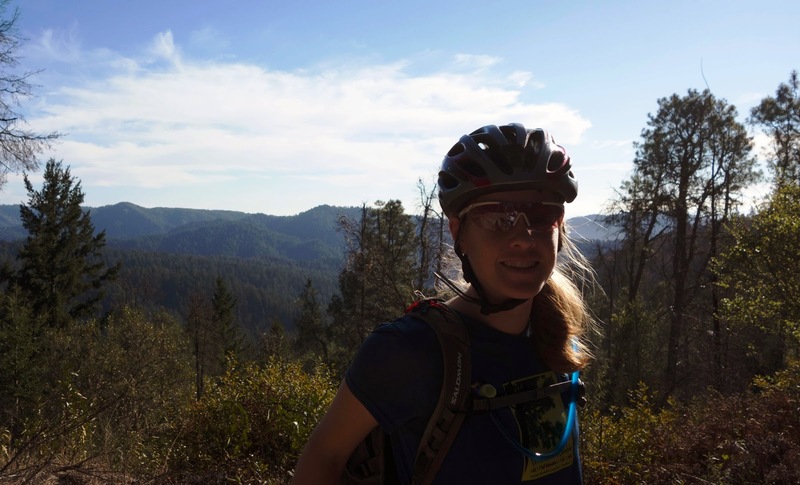 After another descent and climb, we reached Big Basin Redwoods. The higher elevations of this park are an impressive contrast to the misty redwood forests below — sandy, alpine desert with chaparral brush and Douglas fir, exposed to lots of sunlight, and often significantly warmer. Drop a thousand feet and suddenly you're in an entirely different microclimate. 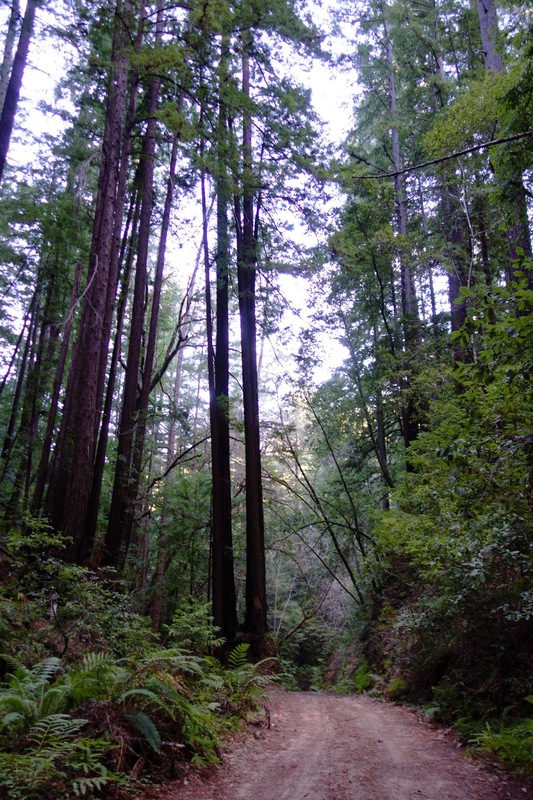 Big Basin is an intriguing region. 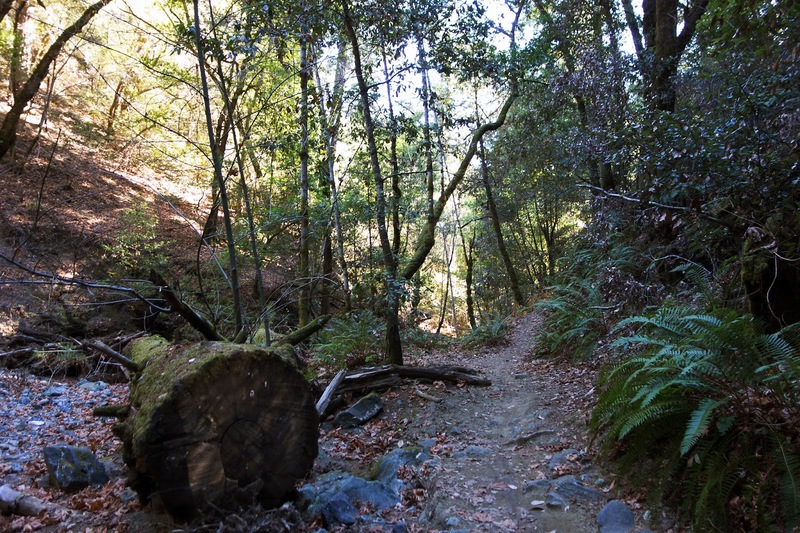 My favorite aspect of Big Basin is the remote, wild sense of the place. I like that I can leave my house, which is located in crowded metropolis of 7 million, and pedal my bicycle to a space that looks and feels like real wilderness. You don't see many people here, either, even on a beautiful sunny and warm Sunday afternoon. There are a few people among these trees, though, who seem to be delightfully quirky. We passed this elaborate treehouse as we descended into Gazos Creek Canyon. 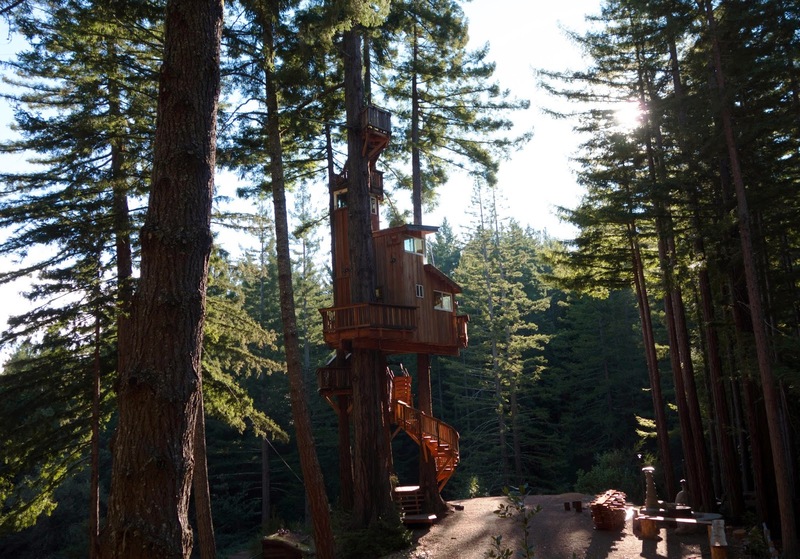 I suppose if I had property in a redwood forest, I too would be tempted to build a treehouse. And what a great spot! The descent on intermittently chunky and loamy fireroad was fast and furious. We plummeted into a zone of towering redwoods, lush ferns, moss-coated rocks and actual water flowing in the creeks (such a novelty!) A rush of cold air made it feel as though we'd dropped into a refrigerator. The temperature was easily in the 40s after leaving a ridge basking in sun and 70s just five miles earlier. Down here is a world that doesn't see much in the way of direct sunlight — in January, probably none at all. 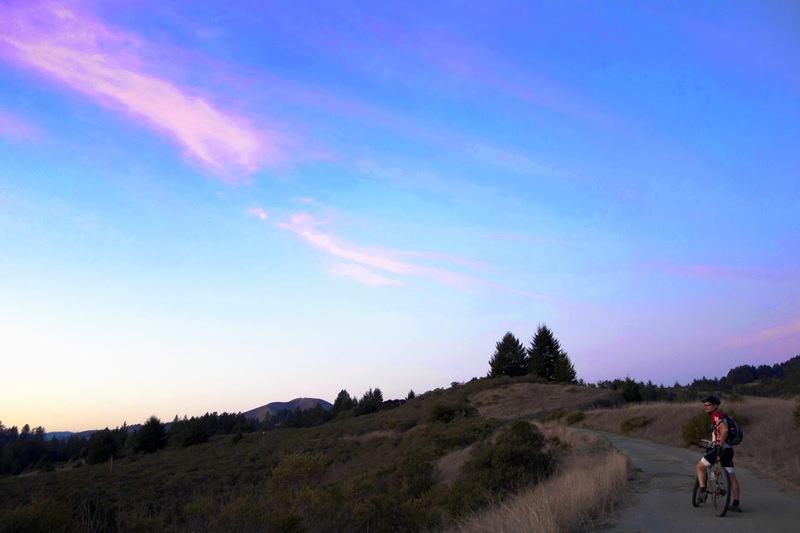 Although I'd felt reasonably okay all day, my blood sugar dropped, along with my appetite, on the long and steep climb up Pomponio Road. 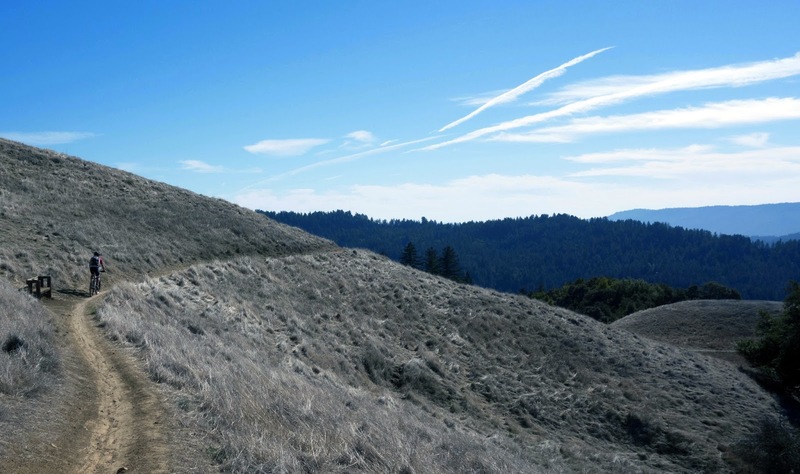 We'd made something of a hard sprint over twenty miles of flatter terrain while wrapping around Pescadero and the Old Haul fireroad, the only way to legally connect Big Basin with Portola Redwoods State Park and eventually Skyline Ridge. After that, there just wasn't a lot left in the tank. I struggled on this climb, mainly with bonky nausea and hard breathing from overworking my cardiovascular system. Just when I really started to feel wobbly, Liehann convinced me to eat an 80-calorie pack of gummy bears, which was surprisingly (actually, unsurprisingly) effective in turning my poor condition around. We crested Skyline after dark and descended Page Mill into a rush of city lights. Exhilarating and satisfying. The ride came in at nine hours total, for 80 miles with 9,289 feet of climbing. The run was 7:16, just under 32 miles, with 6,915 feet of climbing. Sixteen hours of hard effort over two days is not much in the scheme of things, and this is the perspective I'm working on honing with these back-to-back workouts — polishing the long-term sustainable pace and practicing positivity and self-maintenance amid sore body parts and fatigue. And, grumpy IT band aside, it turned out to be a fantastic weekend. I love these long hauls most of all, so indulging in two of them with friends is a special treat. A couple of questions por favor. Is there some place where all your completed or attempted events are listed? If not, maybe you could list them in your profile for us curiouser folks. Would enjoy checking out the event. Joe, I don't have any comprehensive list of my events. There's an Ultrasignup page with most of the trail running ultras I've finished. The ones I didn't finish aren't there, and there are a few others missing that weren't picked up by the aggragator. Thanks Jill......will go check it out. Me curiouser. I love that treehouse! Well--I do like snow but I would also like to be transported there for a weekend to be in short sleeves. Beautiful setting. The snow and ice does force me to slow down though, and get in the gym, so maybe that helps with preventing injury? Hmm...one way to look at it. Hi Jill! I'm sure you get lots of "helpful" training suggestions, so I'll keep this short. I've found that "Farmer Walks" have really helped my IT bands. I'm more stable hiking/running downhill, and my previously-touchy IT bands complain less and less. Thanks for the tip! I always appreciate suggestions. I'm going to look into this.